The latest in KUMHO technology has created a true mud terrain tyre with great street manners and very low noise levels. 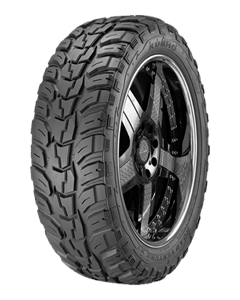 The Road Venture MT KL71 is the perfect choice for the street bound 4X4 that wants the ultra aggressive look of an off road tyre with large rim diameters. At home in mild or wild off road conditions, from tame gravel roads to deep mud, the Road Venture MT KL71 provides excellent off road traction. Durable cut + chip tread prevents cut + chip even under the roughest driving condition. Undertread for ride comfort - A newly developed compound has been used between the tread and steel belt. This blocks out impact and noise from the road surface and enhances ride comfort. High tensile steel belt + jointless cap ply enhance durability and reduce noise levels. Dual body plies protect the KL71 from the stress of on and off road use. Sorry, we currently do not have any tyres with the Road Venture MT KL71 pattern in stock.